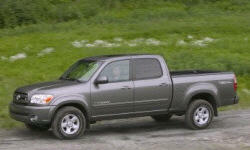 Toyota Tundra Pros and Cons | Page 1 of 2 | Why Not This Car? What drives people to buy (or not buy) a certain car? 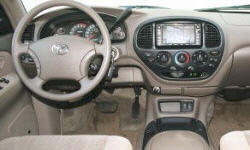 TrueDelta's members share Toyota Tundra pros and cons based on their real-world driving experiences. Lots of room for my long legs and seat is comfortable for the long haul. Enormous blind spot due to the rear pillar width in particular. Highway lane changes would need extreme vigilence and care. Aside from standard maintenance schedules, nothing has unexpectedly broken or proven defective. Even though I have slip behind on the maintenance schedule, it has always performed like new. Have put 84000 miles on this truck and have not had any problems with it. Best in class engine built with up to date technology. Plenty of power for towing or passing. At times the throttle can be toucy, especially in low range. POWER and for all the power i have withthis truck it rides like a car quiet interior and awesome gas mileage for 381 horse power just a great ride i love it. Nice lines and bold design. Because you know this truck will last and that feeling is priceless. Strongest engine out there in the half tons. Very fast. Super reliable. No issues other than ball joint recall. zero problems in four years.